For the xth time, Satanath Records and Black Plague Records are joining forces in order to punish the world with a merciless skull-hammering release, this time under the banner of a split in between two fine acts, Russia’s Drama and Perdition Winds from Finland. The first one, Drama, was an act that was formed almost fifteen years ago in the South-West of Russia, close to the Ukrainian border. But afterwards they moved over to the (beautiful) city of Saint Petersburg. I did use the word ‘was’ in my former phrase, because apparently the band decided to stop all activities under this moniker. That’s a pity. But before fading away into eternal oblivion (oops, I seem to be quite ‘dramatic’ – haha, got the hint? ), they contributed on this fine split with two pretty lengthy tracks that were written and recorded in 2011, and mixed and mastered in 2014 for this collaboration especially. Create Your Death is a slow piece with a certain Post-Black vibe, reminiscent of Khold, Satyricon and the likes (and hey, didn’t these guys cover the latter a couple of times before?). Highly melodious riffs with quite some prominent tremolo leads, assisted by an extremely heavy rhythm section (grandiose bass lines, cool rhythm guitars and plain yet truly supportive drum patterns), take the lead, nicely collaborating with grim, rattling voices that, once again, remind me of the Norwegian semi-Post-scene (cf. Khold and Bloodthorn). With the second track, Gloria Mortis, I get even more impressed. Still continuing the fine-tuned craftsmanship of the opening track, this second one adds some additional elements, like a couple of harsher accelerations (though the slowness remains the spine of their performance), and the groovy attitude honestly convinces. Despite a specific one-directional approach and the slow performance, there are quite some details to appreciate, leaving no room for boredom. The solos, for example (and this goes for both tracks), are quite cool to listen to. Well, to be honest, this material isn’t world-shaking, but for sure it does convince from the beginning till the end. The third track on this untitled split is a lengthy piece by Perdition Winds, which I thought to be a blackened side-project of Lie In Ruins (at least several members of Lie In Ruins did start up this band at the eclipse of last decade). Cult Of Kain is a monstrous piece of no-nonsense heaviness, straight-forward, thrashing, chainsawingly brutal. This guitar-driven composition, which has a running time of thirteen minutes, grooves, destroys, hammers with that mid-nineties’ oriented ‘taking-no-prisoners’ mentality. Here too there is no refreshment nor any renewing aspect, but here too the spirit behind the story, and therefore the basement of the result, is highly appreciable. Besides, the grandiose guitar riffs, the simplistic yet attractive bass intermezzo plus guitar solo in the half of the track, and many more elements, make this track a fine piece of aural pleasure too. Once again it’s proven that the lack of originality does not need to be a disadvantage at all. Besides, the many changes in tempo and the different melodic structures, though being very coherent in result, have been written and performed with professionalism and craftsmanship once again. And despite the length of the track, everything builds up, slowly but convinced, into a magisterial apotheosis – because yeah, that finale of this track is just a fabulous ear-satisfaction, isn’t it! 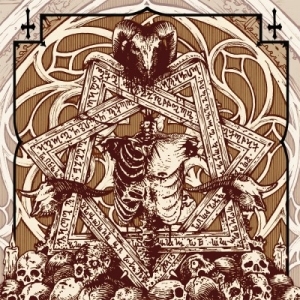 In conclusion: this split is something that will cause nauseous effects when looking for renewing stuff; but open-minded Black Metal freaks, sorry, fans must pay attention. This split for sure isn’t a bad collaboration!